Do your Spruce/Pines trees look like this? Scales are some of the most important insect pests affecting conifer shrubs and trees in Colorado, specifically Summit county, Eagle County and Grand County. Pine Needle Scale feeds on the needles of most pines, spruce and fir. During heavy outbreaks the needles look like they have been splattered with white paint. From a distance the trees may have a silvery appearance. Persistent infestation will result in reduced plant vigor, significant needle loss and eventual death of the tree. It may take several seasons of infestation before a tree will begin to shed its needles so it is very important to check your trees. 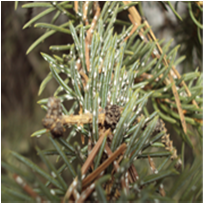 At Summit County's elevation Pine Needle Scale typically hatch and are in the "crawler" stage from the second week of May through the second week of June with a second hatch generally in late July. Populations may be active from a few hours to a few weeks. This active period is the best time for control of this insect. Timing and monitoring are critical when planning applications; depending on the level of infestation, several treatments may be needed to properly control the insects. There are several application procedures available ranging from foliar sprays to soil injections and trunk applications, depending on the size of the tree to be treated. A proactive approach utilizing deep root fertilization to increase the vigor and health of the trees as well as an insecticide application will ensure good tree health. Ascent Tree Services has the experience and expertise to enhance the beauty and value of your landscape investment. Serving the mountain communities of Silverthorne, Frisco, Breckenridge, Vail, Avon, Edwards, Eagle, and Gypsum. We happily service Grand, Eagle and Summit Counties.